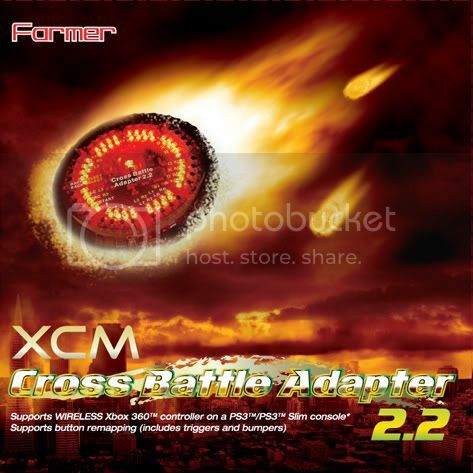 The XCM Cross Battle Adapter 2.2 (works with WIRELESS Xbox 360™ controller) now supports the ability to swap controller triggers and bumpers. You can also remap the functions of A, B, X, Y buttons (Example: Set the function of "A" button to the "X" button or set the function of "B" button to the "Y" button, etc.) and be able to swap the functions of both analog sticks as well! The PS3™ SixAxis tilt function and Rumble are also supported. The best adapter in the industry just got better! The Cross Battle Adapter 2.2 is an adapter that allows you to connect your WIRELESS Xbox 360™ controller to your PS3™/PS3™ Slim console with the ability to remap buttons to how you like it. *NOTE: Xbox 360 PC Wireless Gaming Receiver must be required. No word on pricing or release date but it won't be cheap. Play-Asia will be carrying it as well as Amazon when released.